With near idyllic temperatures during fall, winter and spring, the Naples area subtropical climate makes for a great escape from the harsh weather up north. Average daytime temperatures hover in the 70s in the winter months and 80s the rest of the year, except for July and August, when it reaches 90 degrees most days. These summer months also bring more rain; the area averages more than eight inches of monthly rainfall. But the rain often comes in short bursts, which usually last less than an hour. Naples is officially located at 26°9’N and 81°48’W, which puts it in the northern end of the tropics. You’ll recognize that tropical feel everywhere, with the sea breeze and swaying palms. The City of Naples is just less than 15 square miles, half of which is beachfront, though the beaches extend for many more miles north and south in the rest of Collier County. If you will be arriving by car, head for the southwest corner of Florida. From the northwest come in along I-10 through Tallahassee to I-75 South. Interstate 75 is the main highway into Naples from anywhere, and it even changes its north-south direction at Naples to head east-west between Naples and Ft. Lauderdale, about an hour away, on the east coast. If you are coming from Orlando, about three hours away, take I-4 to I-75. The other main route in and out of Naples is US41, also known as Tamiami Trail, which goes across the Everglades to Miami. About half-an-hour north of Naples, Fort Myers' Southwest Florida International Airport (RSW) has been welcoming visitors to Lee, Collier and Charlotte counties since 1983. RSW is the perfect point of arrival for Naples-bound locals and tourists alike. As one of the nation's 60 busiest airports, RSW receives more than five million travelers annually. When you touch down in the heart of Southwest Florida, it’s easy to see why. You can rent a car or catch a shuttle, limo, or taxi from the airport and head south to Naples. Two smaller airports cater to local commercial and charter air traffic: The Naples Municipal Airport at www.flynaples.com and, thirteen miles to the south, the Marco Island Executive Airport, with luxury amenities. Get information at www.colliergov.net. There is always the option of arriving by boat, and visitors from other Gulf States, like Louisiana and Texas, frequently come by water. Naples’ moorings are plentiful and well-equipped for boats and yachts of any size. The Naples City Dock has facilities available and is ADA compliant. 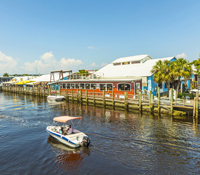 Naples City Dock is located about 3 miles north of Gordon’s Pass at marker 35. Tune in to VHF Channel 16. Located at 880 12th Ave. South, (239) 213-3070. You can also make your trek here by Greyhound bus. This is a popular option for those who ultimately want the hiking and camping adventure and don’t want to be burdened by vehicle parking. It’s a great way to roll if you just want to escape one of Florida’s big cities for a weekend of worry-free fun in the sun. Naples is designed to be foot-traffic and bicycle friendly. Central Park Bus Terminal (239) 774-5660. The local ‘round town bus service is run by the Collier Area Transit (CAT) system. These eco-friendly buses will get you around the City of Naples and most of the county, and even offer a transfer to neighboring Lee County’s “LeeTran” system. Naturally, there are the other usual options of taxis and limo services. The CVB short for Naples Convention & Visitors Bureau provides information, assistance, free visitors guides and travel planning tools for consumers, travel agents, tour operators, meeting planners, the travel press and general news media. The bureau maintains the official travel and tourism website for Collier County, www.paradisecoast.com and a 24-hour toll free travel information hot line at 1-800-688-3600. This is a great first stop for visitors who are new to the area. They are located at 2800 Horseshoe Drive North in Naples. The Greater Naples Chamber of Commerce is available to support the business community by acting as a laison between governmental, community, and business interests. www.napleschamber.org Email them at info@napleschamber.org 2390 Tamiami Trail North, Naples, FL 34103 (239) 262-6376. The Chamber also maintains a Visitor Information Center at 900 Fifth Avenue South in Naples. Naturally, when you think of Naples the obvious activities of swimming, boating, fishing, golfing, and shopping come to mind. But we offer that and so much more to entertain you in Naples. Parks and Recreation www.colliergov.net 15000 Livingston Road, Naples 239-252-4000. Naples and Collier County Parks offer educational as well as entertaining opportunities. There are parks designed for hiking and bird watching, others for canoe and kayak treks, some are ball parks for softball, soccer, or cricket, and other sports themes, like skateboarding, racquetball, tennis, or shuffleboard. Many of Naples’ parks are beachfront and offer amenities such as equipment rental or food and beverages. Some have grills and shade structures. Many have showers and all are ADA compliant. North Florida Regional Park hosts Sun-N-Fun Lagoon, a six acre water park with activities geared for all ages, from the tadpole pool for tykes to the water slide and dunk tank for older thrill seekers. Naples is a haven for nature lovers. Our exquisite beaches are adored by endangered sea turtles as well as human visitors, and the parks department operates programs to protect the nests and educate the public about turtle preservation. Everglades National Park and Corkscrew Swamp Sanctuary are favorites for camping, bird watching and wildlife photography. The options are nearly endless for exploring and enjoying the environment and facilities found at Naples and Collier county, state, and national parks. Beaches range from remote to “well-attended.” Which one you choose will depend on how you’d like to spend the day. You might consider the Naples Pier at 12th Avenue south, Lowdermilk Park, Clam Pass, Vanderbilt Beach, Delnor-Wiggins Pass, or Barefoot Beach State Preserve. Sometimes that unexpected mishap puts a damper on your usually joyful existence. It will go more smoothly if you have prepared for the possibility. In Naples, there are consultants in every field to help with planning for a secure future. PLEASE, if you have ANY medical, fire, or police emergency, CALL 911! But there are times when you’d just like to ask a question of one of our local agencies or authorities, and they are there to help when possible. Collier County Sheriff’s non-emergency line is (239) 774-4434 or Naples Police (239) 213-4844. Call City of Naples Fire and Rescue at (239) 213-4900. Clerk of the Circuit Court (239) 732-2646 Get permits and a marriage certificate, pay fines, obtain a passport, file a small claims lawsuit or file for divorce, etc. Department of Motor Vehicles (239) 434-4600 Apply for driver’s license. Voter’s registration (239) 774-8450 Register to vote, change party affiliation, get an absentee ballot. supervisorofelections@colliergov.net or (239) 252-VOTE (8683). The Senior Help Line can direct your call and suggest services and facilities geared toward our elder population and visitors. Call them at (866) 413-5337. The Retired Senior Volunteer Program (RSVP) is perfect for those still have a lot to offer as volunteers and want to reap the rewards of service to others. Contact RSVP to see where you, or your parent, might fit in (239) 252-4230. The Social Security administration is (800) 772-1213. There are numerous other cultural activities to engage the artistic and creative spirit in you. For residents and visitors alike, what makes the “Paradise Coast” so appealing is our community spirit, the variety of activities to enjoy, and our appreciation of the diversity and beauty of our natural areas. 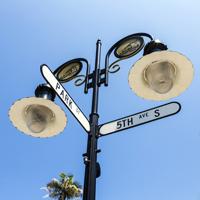 Current news for Naples, Florida and its surrounding communities. Official website for the City of Naples Florida.